Baboons are originally from Africa and Asia. There are 5 species of baboons around the world, however they all fall into the genus Papio. 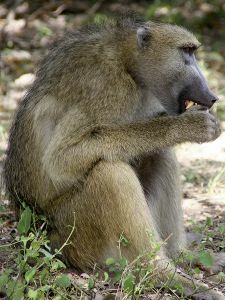 All five species are commonly recognised, although there is a disagreement within the scientific community whether or not baboons are actually a species or a sub-species. A group of baboons is called a troop or a congress. Baboons differ in size and weight, depending on the species. For example, the Chacma Baboon can grow up to 120 cm tall and weigh 40 kg, while the Guinea Baboon is only 50 cm tall and weighs only 14 kg. The 5 species of baboons are Papio ursinus (Chacma Baboon), Papio papio (Guinea Baboon), Papio hamadryas (Hamadryas Baboon), and Papio anubis (Olive Baboon), and the Papio cynocephalus (Yellow Baboon). The Yellow and Chacma Baboon species have 3 sub-species each. All baboons have similar features. These features include close-set eyes, long dog-like muzzles, thick fur, powerful jaws, a short tail, and ischial callosities which are actually rough spots on their buttocks. 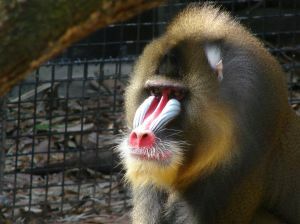 Most of the baboon species have sexual dimorphism, as well as canine development and sometimes colour. All baboon species are ground dwellers. 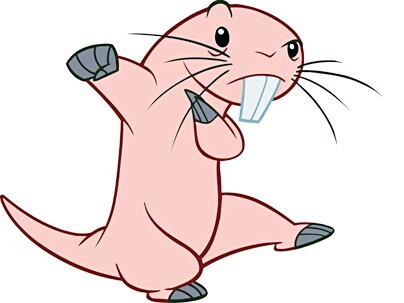 They can be found in open woodland, open savannah, and hills around Africa. They are omnivorous, but they have more of a vegetarian-type diet. They do sometimes eat insects, fish, hares, shellfish, vervet monkeys, birds, and small antelopes. Baboons are foragers, and are active throughout the day and night but at irregular times. They have also been recorded as preying on sheep and goats in South Africa, and have raided human dwellings. Their primary predators include humans, lion, spotted and striped hyenas, and leopards. They usually prey on baboon babies. However, large male baboons will confront their predators by flashing their eyelids, making gestures, shoring their teeth by yawning, or chasing after them. In captivity, baboons have been known to live up to 45 years. 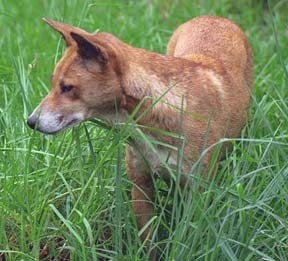 In the wild, their life expectancy is shorter at about 30 years. Baboons are social creatures, who live in hierarchical troops. These groups can vary in size between 5 to 250 individuals, however they usually live in a group of 50. This changes upon the species, time of year, and circumstances. Hamadryas baboons have a different hierarchical structure to other baboons. These Hamadryas baboons have very large groups, which are comprised of smaller harems where one male will have four females. Females will be recruited to the troop when they are still too young to breed. Other species are more promiscuous with a strict matriline dominance hierarchy. In order to figure out what relations and rankings are between individual baboons, vocal exchanges occur. When a confrontation occurs between baboons of different ranks or different families, baboons challenge each other upon ranking. So for example, if 2 families confront each other, the higher ranking baboon will confront another higher ranking baboon as the entire effect can have a wider impact on the whole troop.